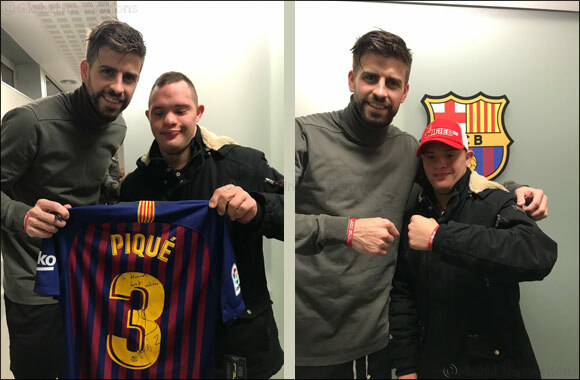 Dubai - UAE, Saturday 9 February 2019: Special Olympics UAE footballer and FC Barcelona super fan, Hamad Al Shehi, met footballing star Gerard Piqué at the team's Spanish training ground last weekend. The two footballers swapped footballing tips and took pictures wearing Special Olympics World Games Abu Dhabi 2019 wristbands after Gerard Piqué finished a training session with the FC Barcelona team. As well as receiving a signed football top, Hamad was also given a full tour of the stadium before watching the big match against Valencia where his favourite player, Lionel Messi, scored two goals. Hamad Al Shehi, who has Down Syndrome, was inspired to take up football by the success of FC Barcelona, his favourite team. A talented footballer Hamad features in a recent documentary about the power of determination and true sportsmanship. Hamad impressed his coaches and teammates as soon as he stepped foot onto the pitch. Sociable and well-liked, Hamad is a much-loved member of the UAE Special Olympics World Games Football Team thanks to his skills with the ball, larger than life personality and infectious smile. He trains alongside players with and without disabilities as part of the Regional Sports Academy team coached by Omar Al Dhiyebi. Based in Abu Dhabi, the team is breaking down barriers through a shared love of sport and a spirit of inclusivity and respect. Coach Omar quickly spotted Hamad's ability as a player and insisted on registering him with the team, including him in training sessions and eventually official games. Coach Omar has worked hard to support Hamad and to boost his natural footballing talent through a variety of exercises designed to increase his fitness and skills. His family have seen a huge change in his demeanor and personality, with the young player eager to tell his parents and anyone who will listen just how much he enjoys being part of a unified team and how happy he is to be playing alongside new friends. The youngster, who plays in attack, hopes to lead the UAE team to victory at the World Games in Abu Dhabi next month.